Experience the world and characters of the hit video game franchise! Question: What is a fiction collection? Hypothesis: “Interest” is an internal incentive that allows humans to practice tolerance. 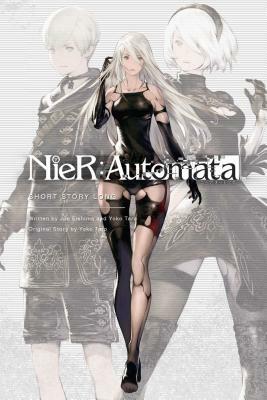 Recommendation: To purchase this volume of short fiction exploring the world of NieR. From Pod 153 to 042: Affirmative. We have concluded executing additional advertisement duties. Jun Eishima. Born in 1964. From Fukuoka Prefecture. Work includes Drag-On Dragoon 3 Story Side, FINAL FANTASY XIII Episode Zero, FINAL FANTASY XIII-2 Fragment Before (Square Enix). Under the name Emi Nagashima has also authored The Cat Thief Hinako’s Case Files: Your lover will be confiscated (Tokuma Bunko) and other titles. In 2016, received the 69th Mystery Writers of Japan Award (Short Story division) for the title Old Maid. Yoko Taro, video game director and scenario writer, was born on June 6, 1970 in Nagoya, Japan. Often seen in public wearing a mask of No. 7 from NieR, Yoko is renowned for his unconventional approach to game design and the dark themes he employs in his stories. He is best known for directing and writing the NieR and Drakengard series of games, both available from Square Enix.